This gorgeous Larimar gemstone pendant has a classic sterling frame and curl pulling it all together to make this beautiful pendant. 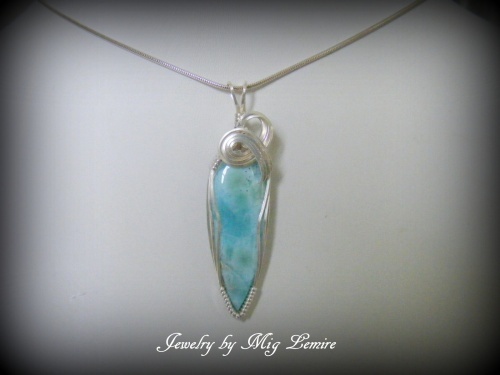 Larimar reminds me of the tropics, so beautiful, serene and so like the water and sky. Piece measures 2" from the top of the bail to the bottom of the pendant and 1/2" wide. Comes with a sterling silver snake chain.